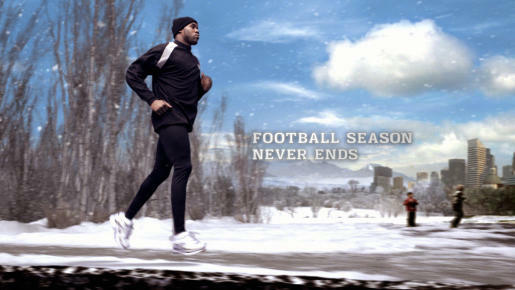 NFL Network promoted broadcast, online and mobile coverage of the game in “Run”, a Super Bowl 2009 spot following a year in the life of an NFL player, set to the new U2 track, “Get On Your Boots” and an original track by Bongo Post and Music. Oakland running back Darren McFadden starts running through the snow, demonstrating that the NFL Season never ends. He runs through four seasons, through night and day scenes, before finally joining his team mates in the stadium. The spot, showcased at the stadium during the game and broadcast on NFL.com, NFLMobile, NFL Network, will also air nationally during the Pro Bowl game in Hawaii, a week following Super Bowl XLIII. The U2 track “Get Your Boots On” was used in the version shown during the Super Bowl broadcast of the game, but due to the wishes of the band it was not to be used beyond that context. Bongo Post & Music, who were responsible for sound design, produced an alternative music track to use in other contexts. “Run” was developed at MeringCarson, Sacramento, by creative directors Dave Mering and Greg Carson, art directors ucho Ortega, Dennis Millette, copywriters Scott Conway, Jeffrey Butterworth, and agency producer Liz Ross. Filming was shot by director Mathew Cullen via Motion Theory, Venice, with director of photography Claudio Miranda, executive producer Javier Jimenez and line producer Bernard Rahill. VFX and post production were covered by senior art director Kaan Atilla, VFX supervisor Bryan Godwin, lead compositor and Flame artist (1.1 VFX) Danny Yoon, post producer Matt Winkel, lighting lead Charles Paek, CG lead Danny Zabrist, designers Heidi Berg, Jenny Ko, Angela Zhu, 2D animation artists Joseph Chan, Evan Parsons, TJ Sochor, 3D artists Ben Grangereau, Michael Clarke, Jericho Green, lighter Matt Bell, modeler Troy Barsness, compositors Deke Kincaid, TJ Sochor, previsualization Patrick Rodriguez, Rotoscope artists Amy Paskow, Eric Almeras, Mike Boden, Megan Gaffney, Kanae Morton, Eva Snyder, Matte painters Ram Bhat, Pete Pace, Flame artists Matt Motal (1.1 VFX), Carlos Morales, Rob Winfield, post production manager Sheri Patterson and post production assistant Rebecca Lindberg. Editorial work was done at String by editor Doron Dor, assistant editor Greg Kim, editorial coordinator Peter Nelson. Sound and music were produced at Bongo Post & Music, Sacramento, by sound designer/executive producer Bob Smith, sound designer Ryan Sibitz, music post producer Debbie McMahon. Audio post was done at Lime Studios, Santa Monica, by mixer Dave Wagg, assistant mixer Joel Waters, and executive producer Jessica Lock.